HOL funny. Have a great Wednesday. Allie, you have the same bikini markings as I have!! We're sisfurs! You're styling even as you're killing. I like that. Allie: Don't you know it girlfriend! We girlcats can hunt our prey in STYLE! Allie, just the sight of your pink nose and hot pink nails puts a smile on our face! MOL! We bet that took practice! 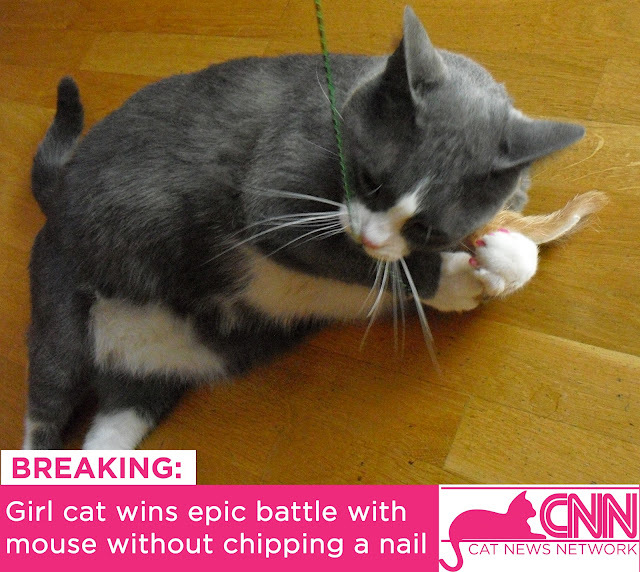 Allie, you are the one cat I know who can do wonders without breaking a sweat - or a nail! Way to go, Allie! That looks like a Neko FLY! Harley broke ours, but we have a new one on order. Allie: oh you are soooo right! We girls have priorities you know, and chipped nails are simply not The Thing! You go Grrl! Allie Rocks!!! YAY! Score one for Allie! I'm sure it took a lot of practice to capture and destroy your mousie without damaging that awesome mani-pedi of yours! Allie: *giggles* why THANK you, Sammy!